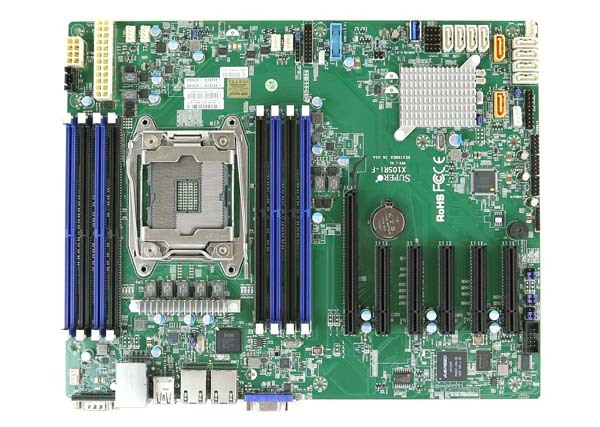 The Supermicro X10SRi-F is a single socket motherboard for the Intel Xeon E5 V3 series. It has a simple purpose: to expose the functionality of a UP Xeon E5 V3 platform and keep costs low. To this end, Supermicro does an excellent job. The current street prices are in the $270-$290 USD range which is on the lower end of the spectrum for single socket LGA2011-3 motherboards. We used our standard UP setup for this type of server. 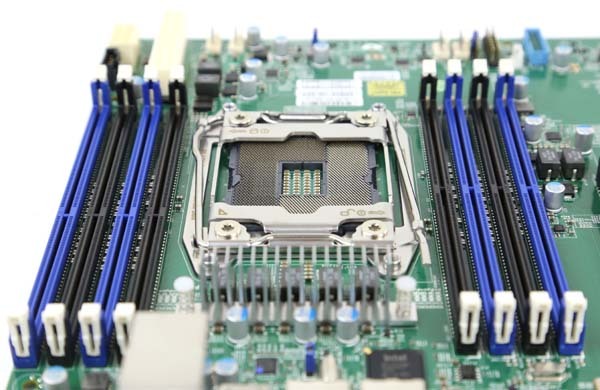 This motherboard can support the Intel Xeon E5-1600 V3 line-up is compelling for those looking for fewer cores and higher clock speeds, however we used one of the higher-end dual socket chips for our testing. Overall, the 128GB configuration is only about half of the standard RDIMM configuraiton and a quarter of what LRDIMMs can do on this motherboard (up to 512GB). On the other hand, it is a reasonably priced configuration. Overall this is a simple setup but should give us a good idea regarding potential performance. We did use our standard add-in card suite including the Mellanox ConnectX-2 and ConnectX-3 cards, Intel 10 gigabit LAN cards, LSI SAS/ RAID controllers and etc. One advantage of the single socket design is that it fits in a standard ATX (12″ x 9.6″) form factor. Keeping the smaller dimensions opens up possibilities in terms of case compatibility significantly with Supermicro listing 19 compatible cases that they make as of this writing in sizes varying from 1U to tower chassis. Another benefit to the single socket design is that even in a standard ATX size form factor it can accommodate 8x DDR4 DIMM slots giving a maximum of 512GB of RAM capacity in the motherboard. Also, the lack of a second processor means that airflow is extremely straightforward. One will need to use a narrow ILM cooler (see our square versus narrow ILM guide). This is the third narrow LGA2011 ILM generation so at this point, there are plenty of options available. 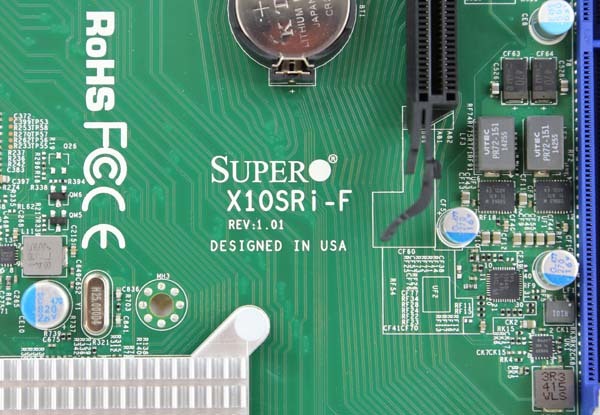 In terms of PCIe slots, the Supermicro X10SRi-F supports six physical slots. The configuration is fixed in that there is a PCIe 3.0 x16 slot, two PCIe 3.0 x8 slots, a PCIe 3.0 x4 slot (x8 physical). That totals 36 PCIe 3.0 electrical lanes out of a maximum of 40. 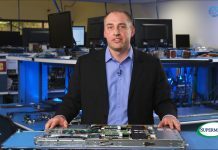 One should remember that there are integrated devices that need PCIe lanes so that is just about the maximum one will see on a single socket platform. Augmenting the PCIe 3.0 slots there are also two PCIe 2.0 slots, an x4 and an x2 electrical both in x8 physical slots. In the picture above one can also see the ASPEED AST2400 chip. This handles the baseboard management functionality allowing for useful features such as out of band management. In terms of drive connectivity, there are a total of ten SATA III 6.0gbps ports. Two of these ports also are supported by SATADOM power connectors for embedded applications. The Intel C612 chipset (under the heatsink) is a major upgrade to the previous generation parts as it supports ten 6.0gbps links versus only two 6.0gbps links and eight 3.0gbps links in the previous generation. Many users that had RAID 1 6.0gbps boot drives and then an 8-port HBA in previous generation platforms will not need the add-on HBA with the new C612 platform. 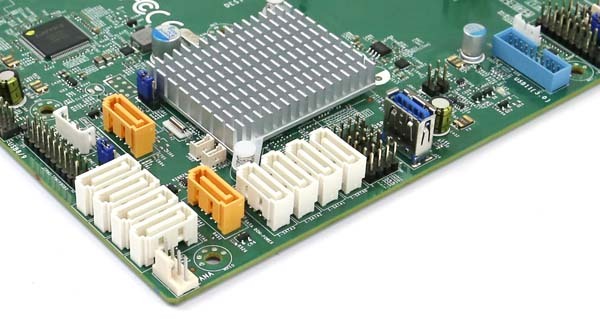 Supermicro also includes an internal USB 3.0 Type-A and front panel connector. We have seen ever increasing numbers of chassis supporting front panel USB 3.0 which is excellent when one needs to use a KVM to load an OS manually in the datacenter. There are also two USB 3.0 ports on the rear panel next to two USB 2.0 ports (along with six internal USB 2.0 headers) which give flexibility in terms of supporting legacy devices and higher-speed devices. Additional legacy device support is included with both serial and VGA connectors on the rear I/O panel. The network port stacked above the USB 2.0 connectors is for out of band IPMI management. The other two controllers are attached to an Intel i350-t2 gigabit Ethernet controller. The Intel i350-am2 is a higher-end controller than the Intel i210 so this is a premium component choice in the gigabit network adapter segement. A great feature is that one can re-use X9 series I/O panels with this rear I/O panel layout. 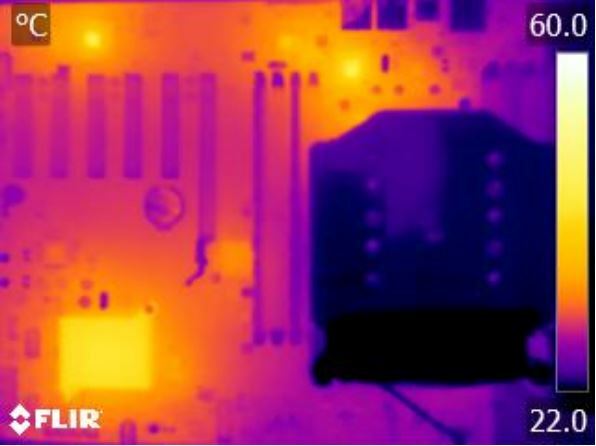 That fact combined with the relatively small ATX form factor means that there is a plethora of chassis choices for the X10SRi-F.
To capture these images we utilize our FLIR Ex series professional thermal imaging camera and turned off the FLIR’s MSX enhancements so we can see hot spots clearly. We put the system under 100% CPU load for a period of 24 hours to let “heat soak” set in prior to taking the images. As one can see, the X10SRi-F stays extremely cool. The few warm spots are the Intel C612 PCH, ASPEED AST2400 controller and Intel NIC. While they are warm, they are still well below specified thresholds by a significant margin so cooling is effective. In other notes, our Supermicro 4U cooler stayed absolutely cool during this heat soak test, even handling the load of a relatively high-end Xeon E5-2690 V3 for 24 hours. 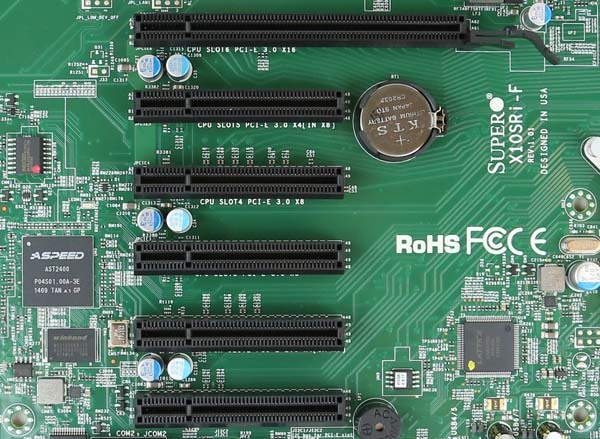 The latest revision of Supermicro’s management features include some key changes and new functionality. 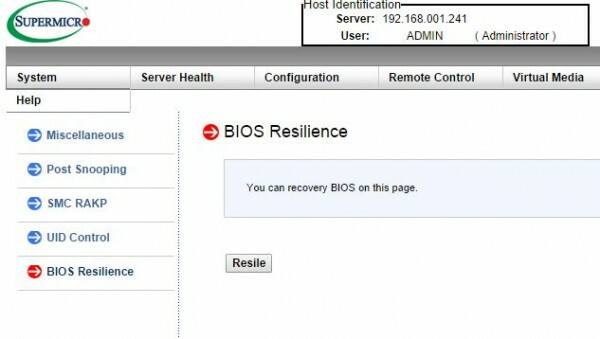 This includes the ability to recover from a bad BIOS flash from the IPMI interface. We will have more on this feature soon, but suffice to say this makes management of remotely located servers significantly easier with some safeguard in the event a BIOS flash goes poorly. The target application for the Supermicro X10SRi-F seems to be the lower-cost, highly flexible single-socket segment. 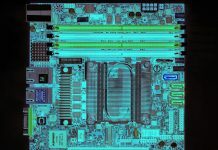 Frankly, with the C612 chipset, built-in iKVM functionality and an Intel i350-am2 dual port gigabit Ethernet controller, there is a good chance this motherboard will be deployed in many cases without additional add-in cards. The addition of six PCIe slots with 36 PCIe 3.0 and 6 PCIe 2.0 lanes exposed for add-in cards means that one can easily add high-end features and customize servers based on the platform. Supermicro continues its tradition of enabling KVM-over-IP functionality with even the lower cost X10SRi-F. Having platforms from HP, Dell, Lenovo and Intel in the lab currently that require add-ons ranging from about $45 and up, this is a great built-in feature that Supermicro is leading the industry in terms of making it a standard feature on motherboards like the X10SRi-F.
Did you use the Supermicro SNK-P0050AP4 cooler, or something else? I’m considering putting one of these in my 743 chassis to make it my next desktop, but after reading about the need of a ‘narrow ILM’ cooling solution, I checked my intended cooling solution and found no mention of support for this, so I’m looking for another low-noise option. Newegg reviews of the Supermicro option mention that their solution is noisy at 100% fan speed, which could be resolved by replacing the fans, but then I have to wonder if I’m sacrificing cooling capabilities. I do. The trick is just to use PWM mode on the fans so they are not at 100% all the time. Very tolerable. You can use NH-U9DXi4 which is fairly quiet. I own SNK-P0050AP4 and with PWM it is not loud at all even with CPU under stress. There is also Dynatron R17 which is similar to SNK-P0050AP4 in the noice department. PWM for the CPU fan did not work well at all. The fan controller oscillated the fan ON and OFF in less than 20 second intervals making the fan noise very annoying. I could not see a way to adjust the fan speed to a select %RPM other than 100% through IPMI. It appears that Supermicro needs to beef up their fan controller algorithm to allow a fan speed setpoint from 0 – 100%. I am using SNK-P0050AP4 from Supermicro in a Fractal Design Define XL R2 (FD-CA-DEF-XL-R2-BL) which is insulated already against noise. In the front I am using an additional blower. The Supermicro CPU cooler I connected to the fan control on the mainboard for CPU. Within IPMI set the fan mode to “optimal speed”. All other chassis blower are controller by the Fractal Design Chassis, which has a 12 / 7 / 5 V Switch in the front. I always use the 5V position and its absolutely silent. Then take as a Graphics card one of the newer nVidia GTX 970/980 with the zero fan feature and you have a noiseless PC for Office and also for Gaming its really silent. BTW, as BIOS I can recommend to you version 1.0b, as IPMI I use v1.87 since quite long. The only little disadvantage of the Fractal Design case is, that it is a “consumer” case, which means there is one hole missing for the upper row for server boards, as these boards have a different RAM placement. But it worked rock solid for me, to leave this one screw out, be simply a little careful when inserting RAM or do it already for this position when you have the board still on the desk. I use it as workstation board as in october last year there was the Desktop board from supermicro for 2011-3 not yet available. 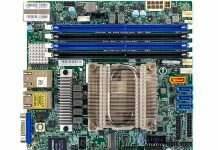 Its really an excellent board, I use it with a Xeon E5-1650v3. The only drawback is the crude fan control, why I put all the fans – except for CPU – under the control of the Fractal design case. Even if this is a server board destined for server market and Data Centre its a pitty, that the BIOS/IPMI does not offer a more finer control over blower. This really limits the potential of this board as also a server board can fit for workstation use, if you only intend to insert one graphics card.